Lorenzo comes from Cesena in Italy. His mobility group UNISER sent him to Slovenia within the prject called TechNet 2020 to do some internship in one of the market companies. ZNI provided him the work in the company Red Orange, where he was well accepted by his mentor Martin and other co-workers. He was given various tasks in the fields of computer programming and website developing. One of the projects that he was working on, was called BeachRex. For that, he had to study, how to publish App on PlayStore and AppleStore, he wrote a document for Martin with all steps for creating profiles and enabling it for App publishing. He also designed a presentation of the App, by using a tool called Invisio for simulate the App. In his free time he did some snowboarding at the Pohorje mountains in the beginning and later kept discovering all the parts of Slovenia. He also travelled to Croatian capital city of Zagreb and the city of Graz, the capital of Austrian Styria region. 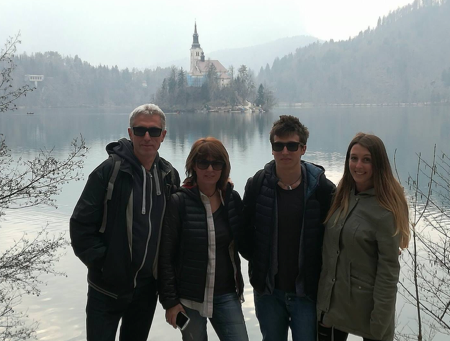 While visiting the lake of Bled towards the end of his internship, he invited his family over to admire the beauties of our little country.